Versital is well known for it’s custom shower trays and made to order resin shower panels. When the architectural interior designer Arkhibuild approached us last year wanting to include custom RAL colours in their design we were all ears! A great idea for a modern bathroom design is to opt for a feature area to stand out against the rest of the room. Opting for a bright colour to stand out against a simple background keeps the bathroom feeling fresh and not too over powering. 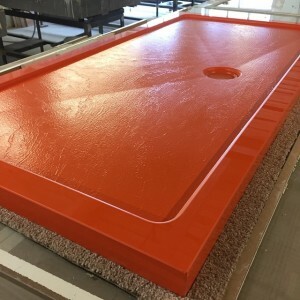 This bespoke stone resin shower tray in RAL 2009 orange will be set against a stunning feature wall panel also from Versital in the exact same colour and material, with crisp white tiles to contrast. All Versital bathroom surfaces including shower trays, resin shower panels and vanity tops can be specified in any RAL colour from the full RAL chart. For more ideas on modern bathroom designs using Versital bathroom surfaces take a look at our other bathroom articles. For a bathroom brochure and more assistance call and speak to the team on 01204 380780 sales@versital.co.uk.